Editor’s Note: Identifying gemstone treatments is a challenging task even for an experienced gemologist. Below you’ll find a review of various gemstone manufacturing techniques and treatment methods and the telltale signs they leave behind. This five-part series of articles, “Understanding Gem Synthetics, Treatments, and Imitations,” is a chapter from Dr. Joel Arem’s forthcoming book, Gems and Jewelry, 3rd Edition. © Joel E. Arem 2011-2013. The International Gem Society (IGS) gratefully thanks Dr. Arem for his contributions to the field of gemology and for allowing us to reproduce this chapter. Each crystal-growing method is somewhat unique and uses different equipment, chemicals, containers, and so forth. Natural crystals also grow in a wide variety of physical and chemical environments. Every crystal-growth process leaves its mark on the growing crystal in the form of color zones, inclusions, surface shapes, and so forth. At any given moment during the growth of a crystal, the surface is characteristic of both the environmental conditions and the growth process. As material is added to this surface, the newly added layer becomes the new outermost layer. We can therefore say that crystal growth is characterized by a succession of surfaces, and a crystal’s history is documented by the record of its surfaces in a way very analogous to tree rings. Moreover, crystal growth environments are seldom absolutely pure. Contaminants may enter the growing crystal and be trapped within it; these may be chemical impurities or sometimes crystals or bits of foreign substances. Even the kinds of surfaces bonding the crystal during growth are characteristic of the growth process. Many of these features are visible, with correct illumination, under a microscope. Microscopy is therefore unquestionably the most powerful working tool for the gemologist who wishes to distinguish between natural and synthetic materials. This is especially important because most homocreate* materials have properties almost identical to their natural counterparts or properties within the range observed for the natural substances. Easily measured properties, such as refractive index, specific gravity, emission spectrum, optic sign, even color, are not always definitive in identifying homocreates. Also, the range of materials and growth methods used today is so vast that considerable experience is required to make positive identification. 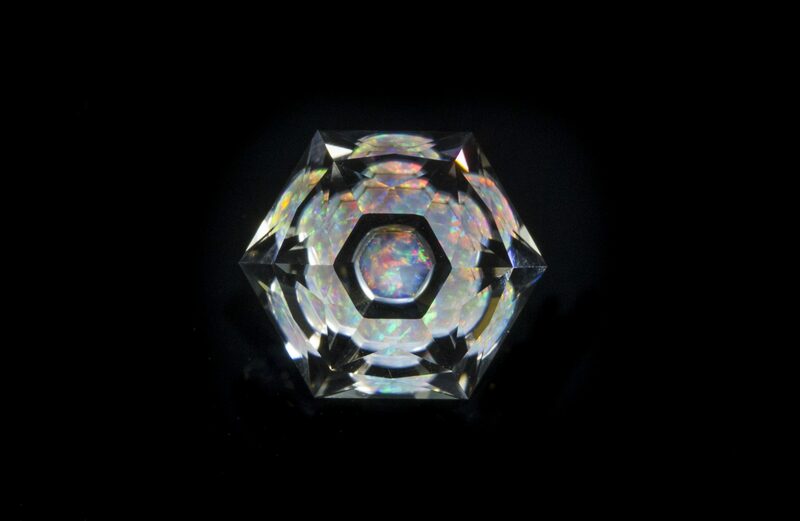 Crystal inclusions may be so small that magnifications up to 50x or more are required to see them properly; such inclusions may be the only proof of natural versus synthetic origin. Some gemstones, such as amethyst and citrine, are extremely difficult to distinguish, and in some cases identification is impossible. The value of a gemstone in the marketplace is largely a function of rarity, a feature not typical of synthetic stones. The marketplace has expressed great concern over the issue of non-detectable synthetics and their impact on gemstone prices. To be sure, a non-detectable homocreate would be a serious problem if no tests could be developed to recognize it. It must be realized that pecuniary interests drive all markets. In the past few years the emphasis has been heavily weighted toward making good homocreates since the monetary return for success is immense and far greater than the reward for developing new detection methods. In other words, you can make a lot more money fooling the marketplace with a newly created gemstone than by selling instruments to detect these gemstones. The gemological field has a lot of catching up to do. Following is a brief summary of the characteristics typical of various homocreate and synthetic gems produced in laboratories. It must be remembered that overlap in features is common, and single characteristics, with a few notable exceptions, are seldom sufficient for positive identification. Vapor growth is not discussed in detail because this method is not of major importance for gemstones. Melt Growth: Some techniques, such as Bridgman-Stockbarger, would leave virtually no identifying characteristics. Czochralski and Verneuil crystals, however, have such rapid growth rates that certain features become apparent. Melt growth is typified by rounded surfaces versus the plane surfaces found in natural crystals. These are observed as faint (sometimes distinct) lines visible with correct lighting. If you want to see what these so-called curved striae look like, take a telephone book, bend it slightly, and look at the side with a 2x magnifying lens. This image of a stack of gently curved parallel lines is very similar to the series of parallel bands (actually the series of former surfaces of the growing crystal) seen in most Verneuil crystals. Curved striae are instantaneous proof of synthetic origin. They are never found in natural crystals. Pulled crystals, however, normally do not display such features. Instead, we may find tiny metallic inclusions that separated from the container that was used to grow the material (for example, platinum) and occasional round bubbles. Round bubbles or tadpole-shaped bubbles with curved tails are also typical of melt-grown crystals and are positive identification features. Solution Growth: This is a real gray area since natural crystals typically grow in hydrothermal solutions. The highest percentage of misidentified homocreates probably falls into this category. Experience, a good, high-powered microscope, and a suspicious nature are likely to be a gemologist’s most useful tools. Multiphase inclusions (gas/liquid) are found in both natural and solution-grown crystals, although three-phase inclusions (solid/liquid/gas) have not yet been duplicated in the laboratory in sufficient numbers to create identification problems. Flux Growth: The most commonly observed feature is flux particles trapped in the synthesized crystal; these may resemble breadcrumbs or comets, clouds of dust-like particles, twisted veils, and so forth. No single feature may prove diagnostic in some cases. Rather, the gemologist must rely on experience and a broad pattern of features for identification. Even so, it is common for some stones to defy analysis. The best rule of thumb is when in doubt, don’t buy. If you pay the price for a fine quality natural stone, be sure it can be proven so. The appearance of rutile on the market started a hunt for crystals that, when cut, would resemble diamonds. A problem existed with rutile because of its unavoidable yellowish color. This problem was solved with the introduction of strontium titanate in 1955. Closely related to rutile, strontium titanate’s advantage was its pure white color, with no yellowish tinge. Its hardness, however, 6 on the Mohs scale, is still too soft to be very useful in rings. Another advantage of strontium titanate is its dispersion, which, though very high (four times higher than diamond), is lower than that of rutile and thus more realistic. Cut gems do resemble diamonds very strongly, especially when they acquire a slight oily film, which further cuts down the dispersion. Strontium titanate does not exist as a natural mineral. Its softness left an opportunity for a still better diamond imitation material. This marketing gap was filled by a material called YAG, an acronym for Yttrium Aluminum Garnet. YAG is one of a family of so-called “garnets,” named because their internal atomic structure is like that of the natural garnets. But here the similarity ends, because YAG and its brothers with similar rare-earth chemistries, such as GGG (Gadolinium Gallium Garnet), do not occur in nature. YAG was originally grown for use in lasers, which is still its major application. It was accidentally discovered that, when properly cut, YAG strongly resembles cut diamond, even though its dispersion is relatively low. In addition, the hardness of YAG is about 8 on the Mohs scale, so cut gems are durable and do not scratch easily. YAG can be colored richly by impurities, and cut stones may resemble emerald, kunzite, sapphire, and other gems, although YAGs are too brilliant and hard to be convincing substitutes for most gems. The newest and most important imitation diamond material is cubic zirconium oxide, or “zirconia.” This material is as hard as YAG (8.5), but has a much higher dispersion. In fact, the dispersion of zirconia is slightly higher than that of diamond, giving extremely realistic “fire” to cut gems. Such stones are lively, hard, and durable, and virtually indistinguishable from diamond to the untrained eye. Small zirconia gems in jewelry settings sometimes pose severe detection problems for the jewelry trade. Zirconia sells for several tens of dollars per carat or less, offering the consumer a stone with much of the beauty of diamond at a fraction of the diamond price. Other gem materials created solely in the laboratory include lithium niobate, sometimes sold as “Linobate,” with a Mohs hardness of 6, yttrium aluminate, and potassium tantalate-niobate, whose chemical acronym is KTN. Few cut gems of these materials have appeared on the market but if encountered they could pose a real detection problem for the average jeweler. Doublets and triplets are composite stones, with either two or three layers. The number of possible combinations of materials usable in making such gems is very large, and a large variety of composites exists in the gem trade. The normal purpose of a composite stone is to display a good color or present a hard upper surface. Seldom is the bottom portion a genuine stone, although doublets of diamond on sapphire or spinel are known. Commonly seen are doublets with garnet tops and pavilions of glass. The garnet portion is so thin that its color is dominated by the color of the glass, which may be blue, green, pink, red, or blue-green. Colorless doublets are also made. Sometimes a doublet is created with a hollowed-out crown that is filled with liquid and cemented to a colorless base. In past years, factories created doublets with colorless synthetic sapphire or spinel crowns and strontium titanate bases. These were effective diamond imitations in which the softer titanate provided dispersion color but was protected from wear by a resistant top. Soude emeralds are made by cementing together components of colorless quartz or synthetic spinel, using a green cement to give color to the gem. Such stones are easily detected if unset and viewed from the side. Other kinds of doublets include those with quartz top and glass base, or with quartz top and colored-glass base. Opal doublets consist of slices of opal mounted on a backing of onyx, ceramic, or opal. An opal triplet has an added quartz top. Ingenious jadeite triplets have been made consisting of translucent jadeite top and bottom, but with the upper portion hollowed out and a mass of the same material carefully fitted and glued in with a green-dyed cement. The resulting stone sometimes resembles the finest “Imperial” jade. The oldest method of enhancing the color of gems was the use of foil backings. Modern methods are much more subtle and difficult to detect. The color of opal may be improved by coating the back with a black substance. Occasionally diamonds are “painted” with a pale-colored dye to offset a yellowish tinge, but the coating soon wears off. Quartz is sometimes stained or dyed to resemble jade or tourmaline. Chalcedony is porous and readily absorbs dyes to produce a variety of bright-colored stones. “Black onyx” is made by soaking grayish-colored chalcedony in a sugar solution and then blackening in sulfuric acid. This process leaves very tiny particles of carbon in the pore spaces of the chalcedony. There are many ways to improve the color of turquoise, such as by soaking in wax (paraffin) or impregnating with plastics, techniques that are often referred to as “stabilization.” Such methods are usually detectable, but should generally be suspected if turquoise of deep-blue color is presented at a modest price. Grayish jadeite can be stained to produce an “Imperial” color or dyed an intense mauve. There is natural mauve jadeite, but the dyed material is much darker in hue. Serpentine, a material not related to jade, can also be stained a rich green color that resembles Imperial jade. Coral is also dyed to give it a more desirable (typically red) color, and black coral can be bleached to produce a “golden” colored material. Lapis lazuli, a rock, is also frequently dyed blue or “touched up” with colored solutions. Dyes are often readily detected because they tend to concentrate along fine cracks and fissures, and these dark lines can be seen under magnification. Surface coatings (wax, polymers) are easily scratched. Modern devices, such as Raman spectrometers, offer a high-tech solution for detecting impregnations and coatings. Even simple tests, such as applying solvents (alcohol, acetone) with a Q-tip and seeing if any color “comes off” a stone, are sometimes quick and effective for diagnosing dye treatment. The effects of heat and irradiation on gems are sometimes unpredictable. In other cases they are used to advantage for improving gem color. 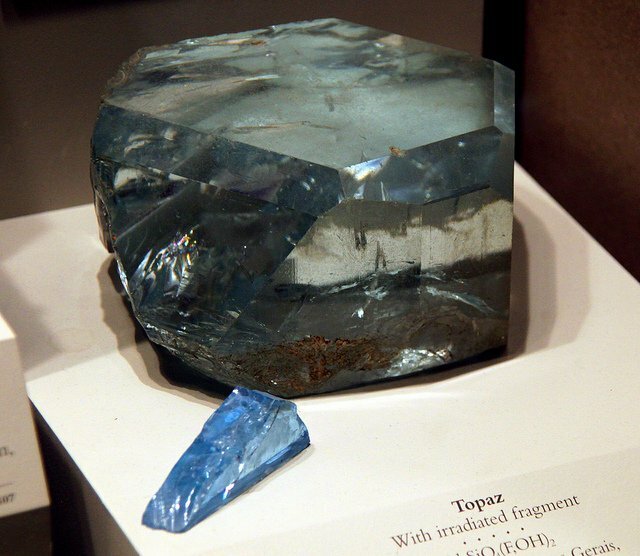 Topaz, for example, occurs in various colors. Pale-blue topaz is not uncommon, but deep, intense blue stones do not occur in nature. Such gems can be produced by gamma-irradiation of certain colorless topaz. This treatment turns the material greenish-brown, but then heating produces a rich blue color. 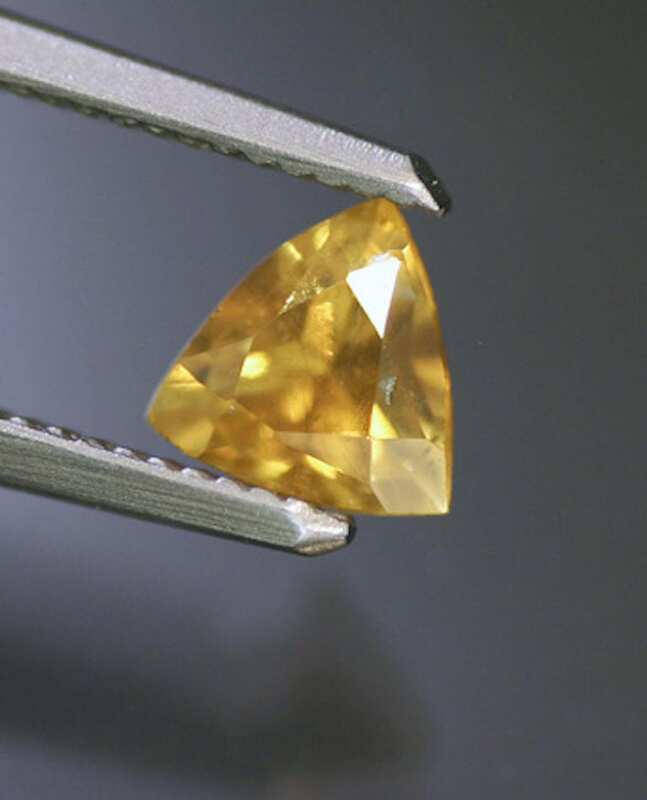 Some golden or yellow topaz can be heat-treated to yield a pink or purplish-red color. 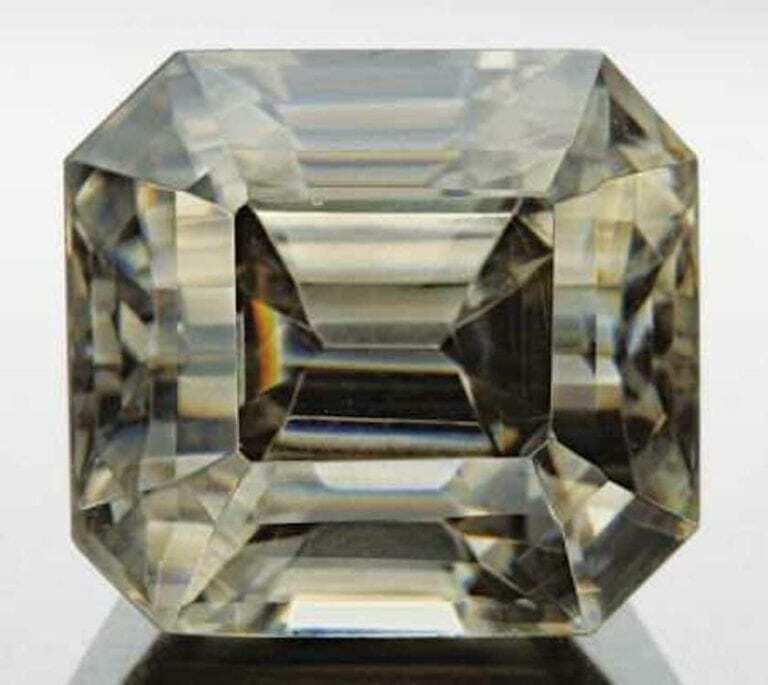 The color of pale-brown or “sherry” topaz can sometimes be improved by gamma irradiation, but heating or exposure to sunlight usually reverses the process. Color fading of natural brown, sherry, and some blue topaz is not uncommon. Unfortunately, in the case of blue topaz there is no current way to detect color enhancement by gamma irradiation. Although some fading may occur, beyond a certain point the color seems to be stable. The inability to prove (or disprove) treatment destroyed the large premium in value that once was attributed to naturally occurring blue topaz. This experience is sobering, and also a warning about the future possible repercussions of non-detectable synthetics and treatments! Heating usually lightens the color of tourmaline, but sometimes a dark-green stone can be made an attractive emerald color. Gamma irradiation of tourmaline produces spectacular color changes. 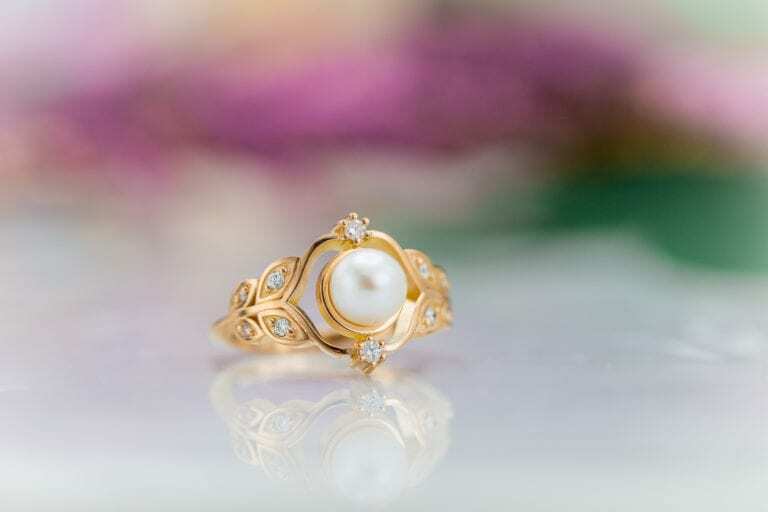 Pale-pink and some colorless stones may turn dark pink. Medium-pink material may turn yellow, and blue gems may turn purple. Pale-yellow tourmaline can be made a peach color by gamma rays. Heating is standard procedure with zircon, turning the drab and unappealing brown material into lovely and desirable colorless and blue gemstones. Tanzanite coloration was once a subject of intense study. 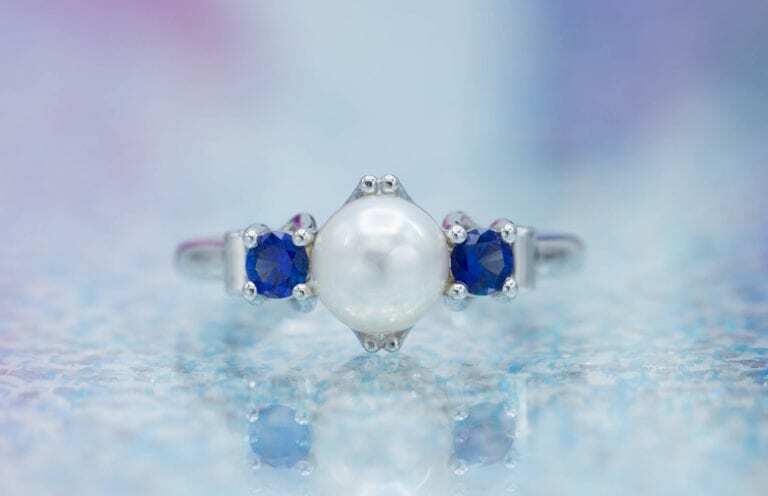 Heating of certain crystals, which eliminates the red-violet color component, produces the lively sapphire-blue color that has made the gem so popular. 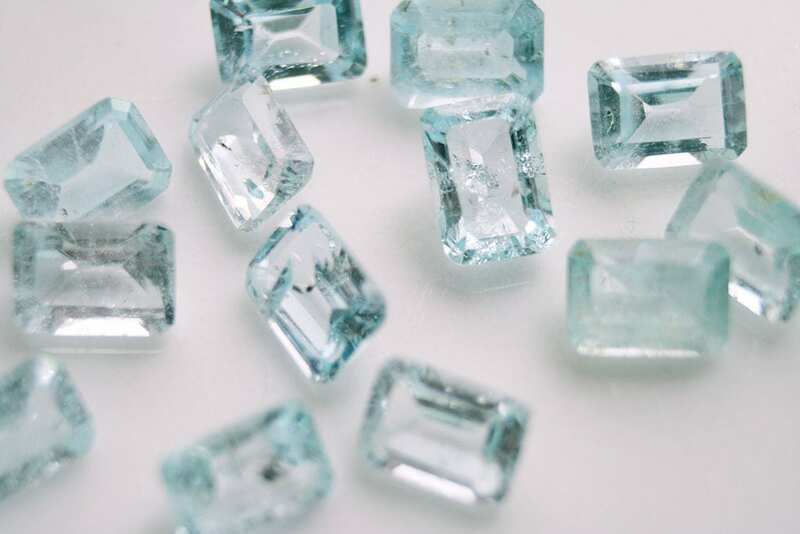 Aquamarine of dark-blue color is quite rare and very costly. Many of the dark stones seen in jewelry are produced by heating greenish or brownish material to a temperature of 400-450°C. The treatment results in a permanent color change. A rare kind of beryl known as “Maxixe type” has a distinctive indigo or cobalt-blue color that can be produced by irradiation. Sunlight and heating both bleach the color of this material to yellow or tan and eventually turn it colorless. Spodumene is not normally heated, although some yellowish-brown material may be changed to a purplish color by heating, and lilac kunzite can be turned an intense emerald-green by gamma irradiation. One of the most commonly heat-treated gems is quartz. Synthetic amethyst is made from a specially prepared smoky quartz by gamma-ray bombardment. It appears likely that natural amethyst acquires its color in the same manner. Gamma irradiation plus heating of some Brazilian quartz produces a bright greenish-yellow color that is not found in nature. This color fades substantially in sunlight. Amethyst may turn brownish or red at a temperature between 400 and 500°C, but sometimes a green color is produced. Green quartz is properly known as prasiolite. (Although such heated gems are sometimes called “greened amethyst” or “green amethyst,” these are misnomers). Further heating causes a complete loss of color. Irradiation plus heating may also produce brown, orange, and yellow hues in quartz. The heating of amethyst to a brownish-yellow color is carried out on a commercial scale. The resulting material is often sold as “Madeira topaz,” a misleading name that should be abandoned. A lighter shade has been called “Palmyra topaz,” and reddish stones “Spanish topaz.” The color change of amethyst due to heating is not always predictable and fading is a possibility. Gamma irradiation of some pearls leads to a gray or bluish-gray color (though not the “black” found in nature). The treatment can be used to improve the color of greenish pearls. The gamma-induced color is uniform and does not fade noticeably in sunlight. Many gemstones are typically filled with microscopic (or larger) cracks and fissures that often reach the surface of a cut stone. These fissures are clearly visible because of the large difference in refractive properties of air versus the host mineral. The cracks “disappear” if they are filled with a substance (such as oil, wax, epoxy or some other substance) that closely matches the refractive index of the surrounding matrix. The best-known example of this treatment is undoubtedly emerald, a gemstone that virtually always displays a maze of internal imperfections that has been kindly and euphemistically dubbed “jardin” (French for garden) by the gemstone trade. 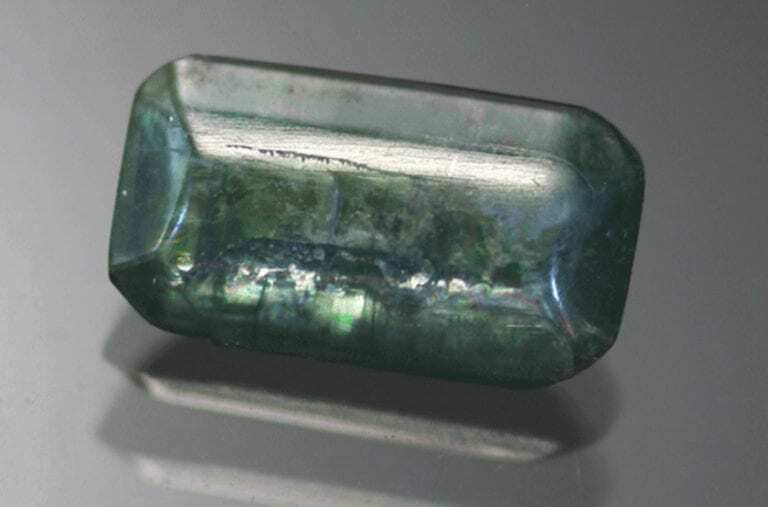 If an emerald is soaked in a green-dyed oil and heated, the oil may penetrate the stone and fill the cracks, effectively “clarifying” it and improving transparency and brilliance. Oiling of emerald has been done for centuries, typically right at the source; eventually the oil evaporates and escapes and the stone returns to its original visibly flawed condition, but it can be re-treated again and again. Fillers such as epoxy and polymer offer a more permanent “fix” and are generally detectable with careful testing. Many other gems are clarity-enhanced with a variety of “fillers.” Even diamond is routinely treated, using lasers to “burn out” dark colored inclusions within a stone. The laser treatment is easy to spot because the intense light beam creates a microscopic “tunnel” through the diamond! Diffusion is a process that allows chemical impurities to enter the structure of a gem material on an atomic scale. These impurities disturb the structure and affect the way light is absorbed, thereby producing a color. The atomically disturbed areas are known as “color centers.” Color centers are the source of coloration in most transparent gemstones, and are ubiquitous in mineral crystals of all types. But laboratory experimentation has revealed chemical process that allow forced introduction of impurities into various gem materials, creating artificial color centers and producing hues in these gems that are due entirely to artificial treatment. Diffusion rates are extremely low in minerals, unless carried out at very high temperatures that would damage or destroy most gems. Exceptions are minerals such as corundum (sapphire) and feldspars that form in nature by crystallizing from a melt and can therefore be heated nearly to the melting point during treatment. Diffusion is an artificial enhancement process that often radically changes the appearance of a gemstone, and is not regarded as “benign” in the same manner as just heating. Heating is an ancient and widely used process for improving gemstone color and (with disclosure) is considered acceptable by the trade. Diffusion, however, can be challenging to detect and therefore has offered unscrupulous dealers an opportunity to commit fraud by intentional nondisclosure of the process. The most extensively studied gemstone diffusion treatment involves the migration of the element beryllium into sapphire. The result is the creation of a new color in the material, frequently orange but also blue, yellow, and red. In large stones the zone of altered color may be visible as a surface layer, but in small gems the beryllium may have penetrated through the entire stone and no such color zone is visible. Beryllium treatment is now routinely detected with spectrometers and other devices that are typically not used by sellers within the jewelry industry. A more egregious example of undisclosed treatment is the gemstone that has been widely sold as “red andesine”, a material of questionable origin and marketed in prodigious quantities in recent years. Laboratory testing has confirmed that the red (and green) color seen in this product can be produced by diffusion of copper into pale yellow colored feldspar. The copper entirely pervades the structure of the host and the resulting coloration can be quite uniform (when viewed without magnification). The only localities on earth that provably yield naturally occurring red and green feldspar are the sunstone deposits in Oregon, and the total production from all these localities combined is vastly smaller than the immense volume of cut gems marketed as “andesine.” It has become generally accepted that “red andesine” is a treated gemstone, despite its continued marketing as a natural stone by dealers whose ethics have therefore been called into question. Recent experimentation suggests that many other gemstone types might possibly be altered by diffusion treatment, even at relatively low temperatures. This implies a future marketplace that is pervaded by treated gems for which detection tests have yet to be developed and the resulting expansion of the epidemic of nondisclosure that is killing the credibility of the gem trade. The jewelry trade is certainly aware of the issues discussed above, and various groups (including the Federal Trade Commission) are working to find solutions that are acceptable to all parts of their industry. One group, the AGTA (American Gem Trade Association) has proposed a list of “codes” to use as product labels, indicating possible treatments. This is an excellent start, and one can only hope that awareness, disclosure and integrity will converge to maintain the health and viability of one of mankind’s oldest commercial markets. 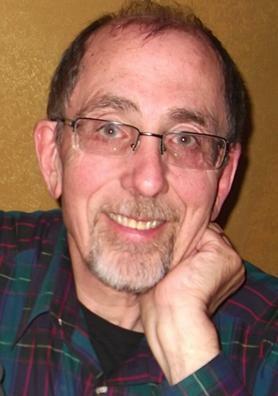 * A Note From Donald Clark: Dr. Arem’s article, “Understanding Gem Synthetics, Treatments, and Imitations,” is a wonderful piece. I have a great deal of respect for Dr. Arem. His Color Encyclopedia of Gemstones is the best reference of its type. He once helped me with a difficult identification. I didn’t expect a personal letter from him and was pleased that he would go out of his way to help me. This was before the existence of the IGS. However, you should be aware that he defines the words “synthetic” and “homocreate” in a manner inconsistent with our industry standards. In my article, “How Gems Are Classified,” I define “synthetic” as “materials that duplicate their natural counterparts” and “homocreate” as materials that have “no counterpart in nature,” in accordance with the Gemological Institute of America (GIA).